I have always loved road trips. There is something about being a car and discovering new places and new things. I have also always wanted to drive through America. I had the opportunity to do this years ago when I drove from California to Atlanta, Georgia and then back months later. It was a great drive, but not as much fun as it could have been. I did not stop much other than for rest breaks and fuel. With this idea firmly planted in my head, it was time to decide which car to take. I had recently acquired a low mileage 2003 540i M-Sport. It would need a few things done to make it roadworthy enough in my mind to make the 6,000 mile or so trip. Then I also thought about using my Suburban SUV, but then it would be as much fun, it would not be a BFC worthy trip AND I would need a gas tank to follow me. Can you imagine what the cost of fuel would be like! Now, in fairness to the M5, it is a pretty robust car in the sense that the S62 performs pretty well and is surprisingly not as prone to issues as the M62 engine that came before it. The M5 was also a comfortable car capable of triple digit smooth speeds when it itch came up.... not that I was planning on that a lot! 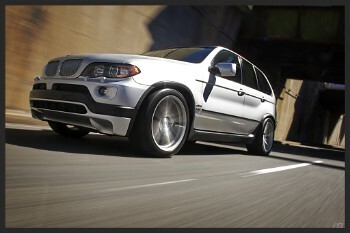 Using the M5 also made this feel more epic. I mean, come on - an Imola Red M5 cruising the back roads and interstate highways of America. What could be more epic??? Okay, so going to the moon is probably more epic, but you catch the drift. I had initially planned to go in June, but there were too many delays and too many things to do, so I pushed it to July. July happens to be Independence month for the US and though I am not leaving on July 4th, the trip still adopted the tag Freedom Tour. What better way to celebrate the freedoms we enjoy living in the US than to exercise that very freedom by going cross country! To make this journey more fun, I decided it was not enough to have an Imola Red Stock M5, it had to had come fun bits on it too. 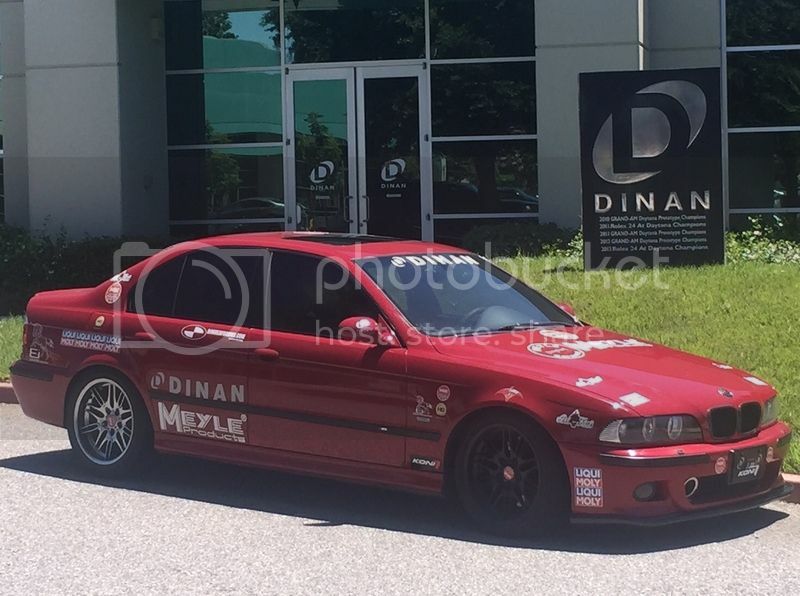 I had a few DINAN parts laying around the garage, so I thought wouldn't it be fun to build a DINAN M5 and take that on the trip. As we all know, one simple idea never ever seems to be the way things go. From that one simple idea will flourish other madness! 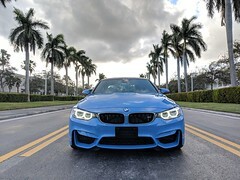 I did not go as mad as thinking of building something like a S/C M5 as time was of essence and also, I needed something that would still deliver somewhat decent gas mileage and reliability over 6K miles or more and in varying climatic conditions. With that in mind, I started building the car. Along the way, as one usually does, I realized I needed more parts. I now wanted / needed DINAN Suspension bits even though I already had the Koni shocks. Then I needed new front end suspension parts like control arms. Then I needed a better exhaust system, even though the stock one was there. Then there was the oil change, plugs, etc. This was about to become a bit of a build. I reached out to some manufacturers and presented my crazy idea. With some, I had built somewhat of a relationship with them over the years. With others, it was first contact. I have to say I was blown away by the response I got. Everyone I contacted was ready to support me and this project in anyway they could. And so, my build started with boxes arriving with new parts and such. 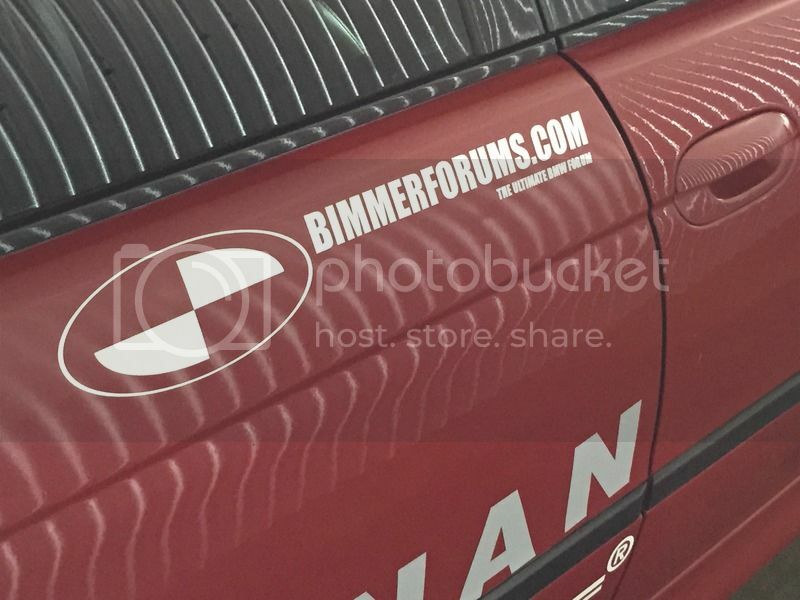 Last but not the least, our very own BIMMERFORUMS! Without all these supporters, the trip would not be taking place in this fashion. I will mention each organizations participation in this project, but that will be down the line otherwise this one post will become a novel. One of the fun things about having all these supporters and partners is that it allowed me to express the boy racer in me and put stickers on the car. Lots and lots of stickers! I think I must have gained about 111 BHP in stickers alone! LOL! I must say here that the sponsors and all DID NOT ask me to put these many stickers on the car, it was a little fun that I got carried away with and I went nuts with stickers! For me though, it also makes it a pretty special car for the trip. It's like I am performing my own solo gumball rally... LOL! Anyway, I hope you will join me or at least follow me a bit on this trip. I will be updating here and on the Facebook page and you can also follow the trip at: www.rovingredm5.com. I will of course also be on FB, Twitter and Instagram. There will be tons of pictures and videos too (if I can figure out how to use my first action cameras). There will be daily blogs and updates. The plan here is to wake up with a map, drop a pin and head out. I will literally be roving in one general direction - either heading out East, or heading back West. It is a fond hope that I will meet a bunch of BFC members along the way. So, if I am going to be in your town or area, let's get together. If you see me on the road, let's pull over and say hello to each other. I have a bunch of friends here already, I hope to make more friends in person. Cheers everyone and wish me luck! Last edited by AquilaBMW; 07-12-2016 at 01:23 PM. Sounds like a ton of fun. Enjoy it and drive safe! If you make it to Richmond, we can tour a few cool shops around town. In for some epic pictures! I'll try to stay updated on your progress to see if you get close to the Philly area at all. Most fun I ever had driving was driving cross country. Enjoy! Thanks! There will be lots of pictures, lots of updates and possibly videos if I can figure out all the equipment... LOL! You will be able to track my progress also, either here or on the blogs. Also, there will be updates made to the BFC Facebook page. Still can't see it? Here... this should help. I couldn't have done all this without all the support from this board and it's members. Hope to see and meet a bunch of members on the road! So basically you are doing a cross country Pokeman Go only with BF.c members instead of imaginary characters. LMAO!!!! That's awesome! Too funny man! I like that idea.... BFC Go! Let's do it! Cool! Give me a shout if you make it around Georgia! You not gonna make it through Denver I suppose? Very cool. If you're in and around the Atlanta area, there's a fairly large BMW community here. Atlanta is on the planned route. How far is that from Macon? Nice huh? We should play Aquila Go while on the trip. Doubtful I will be able to swing down to Denver. We are planning to head north from SLC, UT. I plan on being in ATL. A couple of members are planning a get together when I get there. Currently working with a company called FOLLOWMEE to use their GPS tracker for the trip. I am having a tough time embedding a dynamic map on to our site or anywhere else. However, they are able to provide a link to a public access URL map that will show our position while we are traveling. Would you guys mind clicking on the link below and tell me what you think. Thanks! Last edited by AquilaBMW; 07-14-2016 at 11:21 AM. You should swing up to Michigan to see our Great Lakes! San Francisco - Tahoe - Reno - Salt Lake City - Denver? - Yellowstone Park - Sturgis - Mount Rushmore - Rapid City - Chicago - Detroit - Indianapolis - Maryland - NYC - Richmond - Norfolk - Charlotte - Spatanburg - Deal's Gap - Atlanta - Dallas - Houston - Austin - Phoenix - Sedona - Las Vegas - Los Angeles - San Francisco! I'll be watching as you get nearer to Houston You'll no doubt get plenty of unsolicited route advice. I'll send mine later, but West of Houston can be plenty boring so don't plan on I-10. Norfolk to Charlotte has Durham & Raleigh in between them (I'm in Durham). Around when will you be in Phoenix? Thanks! Route advice is always welcome. I am somewhat loosey goosey as far as my route goes. This will enable me to see as much as possible. Thanks for the heads up on I-10. I have done it once before. If there is an alternative, I am open to it. Okay. I'll be checking in from the road, you'll know an estimated ETA for me in Charlotte. That is difficult to say at the moment. It will be on my return leg, so I can start to estimate from when I leave the East Coast and head down south. Need 25 Participants In A Road Trip Across America Survey! Maintenance is key, just took my xi on its longest road trip.